Many of us hear all the time that we should limit the amount of sugar we consume. But have you ever wondered why sugar is so bad for you, and what it really means when people talk about sugar being inflammatory? This article addresses the important question of does sugar cause inflammation and hopefully help you understand why too much sugar can wreak havoc on our bodies. First of all, it is important to understand that neither sugar nor inflammation are necessarily “bad.” In fact, our bodies need both to survive. Sugar is a crucial energy source for our cells. And inflammation is a defense mechanism our body uses to promote healing. When you have a cut or even a more serious injury, inflammation is the body’s immune response, meant to heal the site of injury or infection. Too much sugar causes inflammation. Even though sugar and inflammation serve important functions in our bodies in moderation, the problem arises when we eat too much sugar, which results in too much inflammation. This can happen when we eat a lot of processed foods with added sugar and refined carbohydrates. Examples include soda, juice, and other sugar-sweetened beverages, white bread, white flour, white rice, processed snack foods like cookies, crackers, chips, and desserts like doughnuts, cake, and ice cream. Eating too many foods with added sugar and refined carbohydrates can result in long-term internal inflammation that doesn’t serve any useful function in our body and can actually be harmful to our health. Chronic inflammation has been linked to a number of serious illnesses such as heart disease, diabetes, and Alzheimer’s disease. Consuming too many added sugars and refined carbohydrates can lead to an excess amount of advanced glycation end products (AGEs). AGEs are formed as a normal part of metabolism; however with a surplus of glucose (from added sugars and refined carbs in our diet), excessive AGE formation occurs. Having too many AGEs contributes to oxidative stress and inflammation by binding with our cells and integral proteins, changing their structure and interfering with their normal function. This alteration can eventually lead to a buildup of plaque in our arteries (atherosclerosis) and decreased kidney function, among other effects. Also, as many of us know, a diet rich in added sugar and refined carbohydrates can often lead to weight gain and obesity. Excess body fat, especially in the abdominal area, causes continuous, chronic levels of inflammation that can alter the action of insulin. Insulin is a regulatory hormone that plays an important role in transporting the glucose in your bloodstream into your cells, where it is used as energy. However, with chronically high levels of blood glucose, the production and regulation of insulin is altered, and insulin resistance can result. Consequently, the excessive amount of blood glucose can lead to an accumulation of AGEs. What can we do to reduce chronic inflammation? Limit unnecessary sources of added sugar and refined carbohydrates in your diet. Minimize your consumption of foods with added sugar (which can be listed on the food label as sucrose, glucose, high fructose syrup,maltose, dextrose), as well as foods with refined carbohydrates (this includes many processed foods such as pasta, white bread, and white rice). Do you need help figuring out foods with no sugar and how to reduce sugar intake? Use our guide to help determine foods with no sugar. Eat more whole grains. Choose whole grains such as whole wheat pasta, brown rice, quinoa, and barley. Due to the high fiber content, whole grains can help slow down absorption, thereby decreasing the speed at which sugars enter the bloodstream. Increase your daily intake of vegetables and fruit. Although fruits, vegetables, and whole grains contain complex carbohydrates and naturally occurring sugars, it is thought that the these foods contain antioxidants, vitamins, and minerals which conversely help to reduce AGE formation. Additionally, fruits and vegetables are high in fiber which can help decrease the rate at which sugar enters the bloodstream. Try to get at least 10 servings a day. Include a variety of antioxidant rich foods and heart healthy fats in your diet. In addition to fruits and vegetables, other sources of antioxidants include flax, chia and hemp seeds, avocado, nuts, wild salmon, omega-3 rich eggs, olive and canola oil, and small cold water fish such as mackerel, herring, and sardines. Eating these foods on a regular basis will help to counter inflammation and reduce oxidative stress. Add collagen protein into your daily diet. Collagen peptides are a high quality protein that can help promote satiety. By keeping you full longer, collagen helps to prevent sugar cravings and promote weight loss. 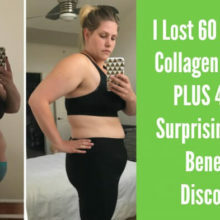 Plus, collagen peptides have a lot of other benefits, including gut healing and helping to reduce the appearance of cellulite. You can mix collagen right into any beverage or food-you won’t notice any change in taste or texture. Try for one to two scoops of collagen daily. Maintain a healthy lifestyle. Lifestyle factors such as exercising regularly, managing stress, and not smoking can help to reduce inflammation. Maintaining a healthy weight is also important in promoting proper insulin function. So, now you know the answer to the question does sugar can lead to inflammation. Inflammation in turn can cause obesity, heart disease and a general lack of balance. It’s time to take charge and reduce your consumption of unnecessary sugars. There are so many healthy foods and recipes that you can include in your diet that don’t contain added sugars and instead are full of nutritious vitamins and antioxidants that will help you stay healthy. Need some ideas? How about our Raspberries, Blueberries and Dates Smoothie or Eggplant “Meatballs” and Veggie Spaghetti? Once you discover all the ways you can eat without adding sugar, you won’t even miss it! Hi Alex, thanks for sharing this post, it’s very well written. By changing my diet, I am now able to manage my inflammation. I also have more energy by limiting sugar and refined carbs intake. I just finished reading this article over at http://www.totalbeings.com/organic-total-body-reboot-review-heres-what-i-really-think/ and would love to get your thoughts. Thanks heaps again for the tips, I’m sitting on the fence if I should sign up or not…Cheers!